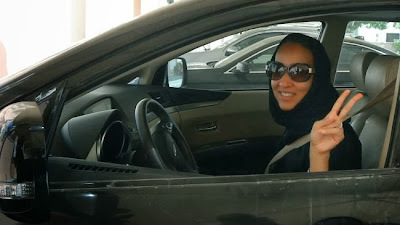 Two of Saudi Arabia’s best-known female advocates for lifting the ban on women driving were arrested and detained on Friday after being caught behind the wheel in the country’s capital. Rubbish Law. Try dat in Naija n c d outcm. Saudis are starting to lose their grip on their woman. they can no longer use religion to disadvantage woman. this is 2013 for Christ sake. I cant imagine not driving my lovely car simply because I am a woman. very backward indeed. Where are the big mouth human right police? Women shall start Libyan style revolution in Saudi Arabia. Watch out f**kers!! !